On Friday, October 28th (happy b’day to me! 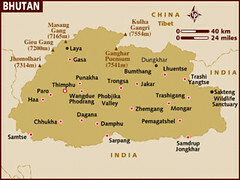 ), my mom and I will be taking off for our two-week trip to Bhutan. 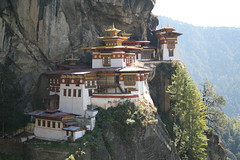 Located between north-east India and what was once Tibet (now China), Bhutan is the last Buddhist kingdom in the world. It sits at the foot of the Himalaya mountains, so while much of the country is high-elevation for us (1200 to 2500 meters), Bhutan only borders on the highest peaks (generally 7500+ meters). Consequently, much of the tourist and mountaineering traffic that has affected countries like Nepal has passed Bhutan by. Thanks to Lonely Planet for the map! 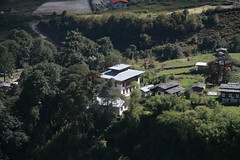 Days 1-3: In flight to Paro. Day 5: Paro to Punakha. Day 6: Phunakha to Trongsa. Day 7: Trongsa to Bumthang. Day 8: In Bumthang area. Day 9: Hike from Jakar to Nga Lhakhang (2743m – *gasp*). 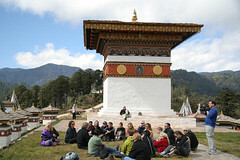 Day 10: In Nga Lhakhang. Day 11: Nga Lhakhang to Bumthang. Day 12: Bumthang to Phobjikha Valley. Day 13 Phobjikha to Thimphu. Days 16-17: In flight to NYC. Wish us “good luck” — or as they say in Dzongka (the Bhutanese language) “tashi dalek”! Well, we surivived the flight — 18+ hours from J.F.K. to Bangkok, a 12-hour lay-over and then a 5-hour flight to Paro, Bhutan, with a stop in Calcutta for fuel. With Paro tucked neatly in a valley (like most of Bhutan’s cities, I expect), a plane’s landing approach includes a last-moment low-altitude turn for excitement. 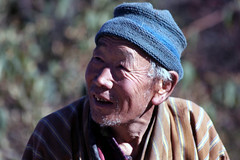 Paro sits at about 7,600 feet or 2,300 meters, so altitude sickness is possible but not common. This makes Paro a pretty good place to start getting used to the thin air. After lunch, we drove across the valley to the Paro Dzong. Found throughout Bhutan, dzongs vary in size, serving as a combination monestary, administrative center and in earlier times fortress. The Paro Dzong is one of the largest, with a central tower, a surrounding courtyard and an outer 3- to 5-story wall that itself contains many rooms. While I haven’t felt any affects of the altitude aside from shortness of breath, the jet lag is still a bit of a factor. 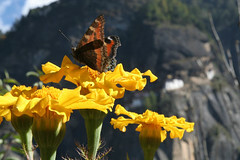 On Monday we stay in Paro, taking a morning hike up to Takhsang, a monestary that clings to the edge of a cliff. Monday had been originally scheduled to be a slow, relaxing day of acclimatization in Paro, but we decided to make a change. We are going to be in the capital, Thimphu, on November 11th — which happens to be the King’s birthday. Rather than spend the morning there and then most of the day driving back to Paro to visit Takhsang monestary, we chose to do the Takhsang climb today and leave ourselves free to spend more time at the Royal birthday ceremonies. “Takhsang” is dzongkha for “Lair of the Tigress,” and refers to a great meditator of the past who is said to have flown to a cave on the back of a tigress. The cave still exists and the monestary has been built around it. 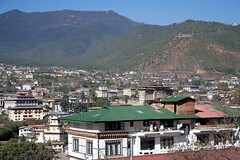 The city of Paro is at about 7,600 ft./2,300m. The footpath to Takhsang begins at about 8,200 ft./2,500m and continues up to the monestary at just about 10,000 feet or over 3,000 meters. Along the way, a tea house offers a rest point at 9,700 ft./2950m. The path is well maintained but winds through a relatively thick forest, including pine, cedar and many flowering plants that are still in bloom, despite the late season. After leaving the tea house, the footpath rises up level with the monestary, but then drops back down about 100 ft./30m to reach a bridge over a long thin waterfall before going back up to the monestary entrance. Just before this fall, we came across a monk taking a break from the walk and enjoying a chat on a cell phone — not your average monk, I suppose! Also, thanks to all who sent me birthday wishes! Today, we said good-bye to the beautiful and cozy Zhiwa Ling hotel and ventured out toward central Bhutan and our goal for today, the town of Punakha. Located in one of the most fertile valleys in Bhutan, Punakha’s terraced rice fields regularly yield two full harvests each year and thanks to its mild climate it is home to one of the queen’s winter homes. The drive was a significant one, taking about six hours, including a stop for lunch. But before we got to the restaurant, we had to go over the mountian pass at Dochu La at just under 10,000 feet or 3,000 meters. Dochu La is a set of large stupas built by one of the queens in recognition and thanks for the safety of the king during a recent period of military exercises. Since it is only 2-3 years old, Dochu La is in excellent condition. 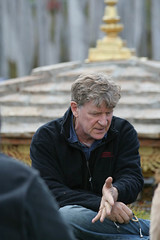 We took advantage of the magnificent scenery and good timing to get a short teaching from Robert Thurman, one of the trip leaders and a close personal friend of the Dalai Lama. Today’s teaching focused on one of Buddhism’s basics, the Four Noble Truths. 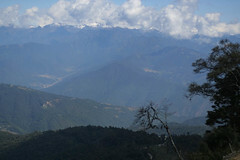 The view from Dochu La is quite grand, with snow-capped peaks visible through the clouds. 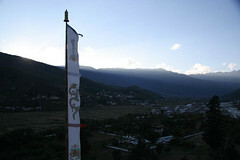 Also visible from Dochu La is the village where the four queens of Bhutan (all sisters) grew up. Coincidentally, the entire royal family was travelling from Thimpu to a town west of Paro today for a “town hall”-style meeting about the newly proposed consitution, so we got to see each of them as their motorcades drove by heading east as we headed west. Our drivers were quick to spot the royal license plates, which in lieu of a license number simply reads “BHUTAN” in the case of the king or BHUTAN and a number for the queens and other high-ranking officials. Upon arrival at Punakha, we had a chance to explore the Punakha Dzong, one of the most important administrative centers for Bhutanese Buddhism. Located at a point where two major rivers meet, Punakha Dzong has hosted every royal wedding and is the only place where the body of a deceased Je Khempo (Bhutan’s equivalent to Tibet’s Dalai Lama) can be properly cremated. One of the rivers rises at a low altitude making its waters clear, and it is said to have a feminine essence. The other comes from snow melt at the highest altitudes, making its waters a milky slate- to turquoise-color, and is said to have a male essence. 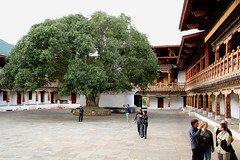 In the main courtyard is a bhodi tree, grown from a cutting taken from what is said to be the original bhodi tree in India under which Buddha first gained enlightenment. Somewhat more unnerving was the massive bee hive that hung four stories up, directly over the main entrance to the dzong. Clearly, an example of live and let live! Today was another traveling day, bringing us further into central Bhutan as we moved from Punakha to Trongsa. While most of the day was filled with driving, there were a number of high points — both literally and figuratively. Early on, we needed to fuel up and the stop brought us to a small open-air market. I thought that since the chili is eaten here as a vegetable rather than a spice, I might buy some and maybe have them on hand for some sort of emergency. 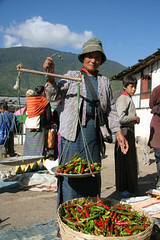 One kilogram of these hot peppers cost 70 Ngultrum or about $1.75. The market was right next to a school, and while we could not see over the wall into their courtyard, the market was filled with the sounds of children singing. Any number of characters were at this fueling stop, not the least of which was one old man with a chiseled face, a mouth full of doma (betel nut and lime, which is chewed like tobacco) and a Hello Kitty hat. Our path took us over Pele La, a pass that tops out at just over 11,000 feet or 3350 meters. Like much of the rest of the day, the view from the pass was amazing. 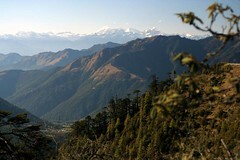 Much of this central area of Bhutan is part of the Black Mountains, a forest preserve that allows a number of endangered species like tigers and leopards to migrate along their annual north-south routes with minimal human disturbance. Since the valley reaches down to under 4,000 ft. (1200m), this area is home to many animals more commonly associated with India, including cobras and monkeys. 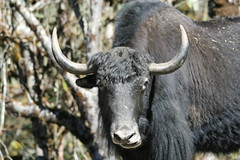 With the road to the pass climbing above 10,000 ft. (3000m) for a fair stretch, we encountered out first yaks. Yak herders are careful to keep their animals at high altitudes, since they develop fatal lung infections below about 7,500 ft. (2300m) and a number of species of low-altitude grass are poisonous to them. Closer to Trongsa, we passed a small farming village in the valley. The town and its farming fields sit atop a small spur of land running down from a hilltop that was once said to be a giant snake that made mischief in the area. 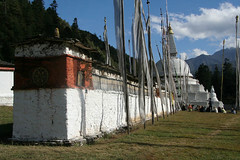 This spirit was subdued by building the dzong on its head, and now its scales are said to be the different areas of crops that run up the spur. We had lunch at a restaurant lower down on the other side of the pass near a large chorten that was built to mark the place were a great meditator had subdued an evil spirit that was causing misery throughout the valley. This mantra of compassion is the most common Buddhist mantra and is found on prayer wheels throughout the land, many set near waterfalls so that the passing water turns the wheel, sending out the compassionate mantra each time it revolves. It is said that each of the six syllables sends its effect to one of the six realms of the cycle of birth and death: the realms of humans, hungry ghosts, hells, animals, titans and long-lived gods. Today, yesterday’s long drive paid off, with a leisurely breakfast and short walk to the Trongsa Dzong. 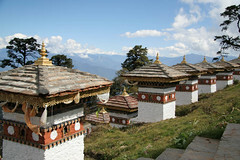 Trongsa has long been a strategic area in Bhutan, located nearly at the half-way point on the east-west trade route. 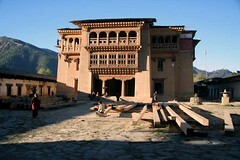 That trading road at one time actually passed through the dzong itself, at which point taxes on the goods were collected. The first king of the current royal lineage was an official at Trongsa Dzong, and that source of influence was so important that even today, a crown prince must be named to an honorary post at Trongsa Dzong to be considered heir to the throne — similar to the Prince of Wales. Once inside the dzong, we were granted a wonderful tour, thanks no doubt to Bob Thurman’s presence, which included a chance to see a ceremony in progress and a the opportunity to do a meditation while sitting in a temple to Maitreya that is not generally open to the public. 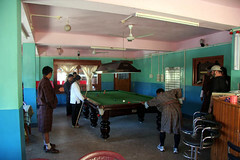 One surprize was to be found in the “Oyster Bar” — a full-size snooker table that had been brought up, not only the mountain to the town, but then up two flights of miniscule stairs! Then it was on to Bumthang, the textile region of Bhutan. Fabrics here are still woven by hand using a treddle or back-strap loom and some of the most complicated designs can take months to finish. To get there, we had to cross two more passes, both above 10,000 ft. (3,000m) complete with yaks. While the altitude for us is quite high, for the yaks it is actually rather low and the relatively warm temperatures mean that they have shed their heaviest coats and their more common wooly looks. Their herder was content to sit on the side of the road and let the yaks roam rather far off, eating the dwarf bamboo that is said to make their milk richer in cream. In preparation for our major hike tomorrow, today was scheduled to be easy with some sites in the morning and the afternoon free. 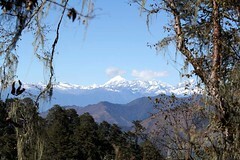 While much of Bhutan is cool due to high altitude, its latitude is the same as northern Florida, so at lower altitiudes the climate is sub-tropical. Today was the first morning that cool weather and altitude combined to leave a layer of frost across the landscape. 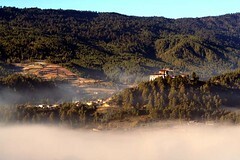 The lower level of the Bumthang Valley was completely covered in mist, clearing just low enough to allow us to see the Jakar Dzong on the opposite hillside. Before making our way to Jakar Dzong, we had a short walk to a monestary that features some of the oldest Buddhist frescoes in the world. Dating to the 15th century, they may not seem to be that old. 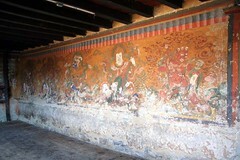 However, it is more common for these paintings to be redone when they begin to show age and wear. 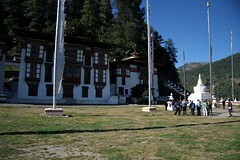 The monestary was built by Pema Lingpa, one of Bhutan’s most important religious figures. Pema Lingpa was a reincarnation of Guru Rinpoche who first brought Buddhism to Bhutan and was an adept finder of Buddhist treasures, writings that had been hidden in caves, hollow trees and similar places during times of persecution. 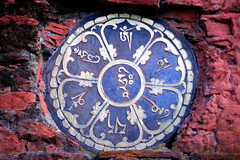 In addition to the wonderful art (much of which could not be photographed, since pictures generally cannot be taken inside the temples themselves), this monestary has a 55 pound (25 kg) chain mail cape that dates to around 1435, made by Pema Lingpa himself, who had been trained as a blacksmith before becoming a monk. It is said that anyone who runs three laps around the temple wearing it will cleanse hundreds of lifetimes of bad karma. While it set us back in our schedule, we all decided to take advantage of this rare opportunity — despite the fact that running anywhere at 8,300 feet (2530m) is a lung-bursting experience, even without a chain mail cloak. The head lama was kind enough to allow us a few quick photos of the cloak, even though it cannot be taken out of the temple. explanation of trancendent wisdom. (While such insight is difficult to cultivate and maintain, it is not very hard to understand intellectually — my only hope it seems!) Then it was on to lunch, at a restaurant near the royal estate in Bumthang. After lunch, we made our way to the Jakar Dzong, which is the other main destination for the Bhutanese who come to the area on pilgrimage along with Pema Lingpa’s monestary. 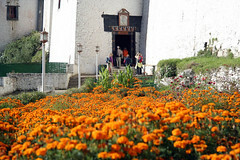 The Jakar Dzong dates to the time of Guru Rinpoche himself and the earliest introduction of Buddhism to Bhutan. In the 8th century, the king of Bhutan lost his son in combat. 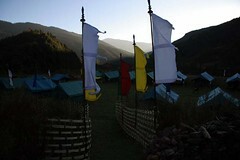 The king was so distraught that he renounced his allegience to the local protector deity, Tsiling Karpo. Soon after the king fell ill and could not recover. 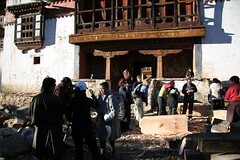 His ministers decided to send to India for help and invited Guru Rinpoche to Bhutan. Guru Rinpoche came and began to meditate in a cave where Jakar Dzong now stands. During this meditation, Tsiling Karpo appeared to him in a number of terrifying forms, eventually taking the form of a snake. At this point Guru Rinpoche turned into a bird of prey and grabbed the snake, holding it down and teaching it the dharma. 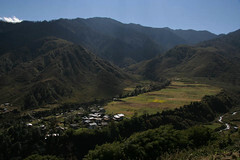 Subdued, Tsiling Karpo agreed to become a Buddhist deity, protecting the region. The Jakar Dzong is centered around the cave where Guru Rinpoche meditated, leaving his body imprint in the stone wall that is still visible today. 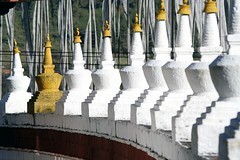 The dzong is surrounded by 108 chortens, including a black one facing west, a red one facing north and a yellow one facing east. 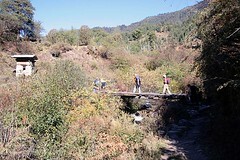 Our short trek out to Nga Lhakang village began at the end of the Bumthang Valley. After a bit of hiking to get out into the countryside, we were met by a small contingent from Nga Lhakang who offered tea, chang (the local beer) and arra (the Bhutanese counterpart to moonshine) for good fortune on our trip. One of the villagers also offered some saffron rice to accompany our drinks. Then we began our hike in earnest, following the river northwest along a footpath that until recently was the only way to and from Nga Lhakang. While the path is reportedly “flat” and “smooth” by Bhutan standards, this was no simple walk, since it included crossing a number of springs, climbing through some narrow, rocky parts and at one point required following a stream bed — in the stream bed! 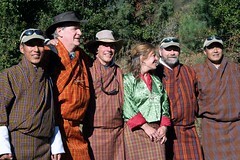 A short distance from the village, we stopped for a rest and for some of us to change into Bhutanese garb: a gho for the men and a kira for the women. By the early afternoon, we reached our camp site, a superlatively organized area with “his” and “hers” bathroom tents, shower tents and a “parlor tent” with a table and mirror. We were met by the Village Head Man and a small entourage who welcomed us to the area. We were given an opportunity to meditate in the local temple, which was just as well appointed and ornate as those found in much wealthier and more densely populated areas. Bob decided on a teaching and meditation from the Book of the Dead, reviewing some of the aspects of meditating on the subject of death and of the nature of the “bardo,” the state between lives. After dinner, we had an evening to recover from the hike with tea and drinks around a fire to ward off the chill that began to encroach once the sun set. As an excellent surprise, the staff prepared our tents with not only down sleeping bags, fleece liners, pillows and air mattresses, but also a delicious hot water bottle to pre-heat the beds! Indeed, this was camping in the best of all possible worlds. That night was, in fact, a cold one and when dawn broke, the warmer mists rose only partly up the valley and our entire camp was coated in frost. 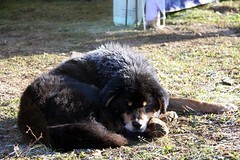 Even the poor dog that had taken up residence near our campsite was not spared a dusting of ice. Despite the temperature, we could hear the monks’ horns from the nearby temple getting ready for a ceremony that would take place later that day. After breakfast, the sun was high enough to reach the camp directly and warmed and dried the area, quickly making it very comfortable for our reception in the town. 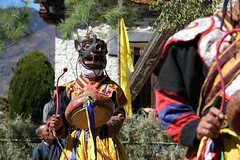 When we made our way back down to the village we had another ceremonial chang reception and then a number of masked dances, folk songs performed by young ladies and songs and dances children from the area. After the performance, we had lunch and the children lined up for butter tea, a savory broth-like mix of black tea, butter and salt. Then we had a tour of the home of the Village Headman where we got to see his own personal temple room, his family’s treadle loom, the kitchen and main room, complete with a classic chiminey-less hearth. Life in his house didn’t stop for our tour, so there was vegetable cutting, soup boiling and meat drying all going on around us. That afternoon, many of us chose to relax at the camp, taking warm showers with the pump-canisters full of hot water in the two shower tents. Another group ventured up to a nearby ridge where there are ruins of an old military outpost. Unlike nearly every other relic in Bhutan, this area does not show up on any historical map and no one seems to know when it was built or by whom. The purpose, however, was likely to guard against the Tibetans, since the location holds a commanding position overlooking both sections of this L-shaped valley, the northern part of which leads to Tibet. Unfortunately, time has taken such a toll that the fort is nearly indescernable from the forest. A few sections of wall still stand where tree roots bind them together. 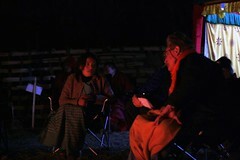 Our second evening would be our last, so the villagers were invited up to our camp to send us off. 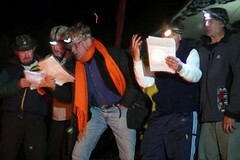 The drinks flowed and spirits were high after dinner as the villagers performed more folk songs around the fire. The visitors’ part was held up well, thanks to rousing renditions of Amazing Grace, Respect, Hey Jude, Like a Rolling Stone and a heart-felt exposition of the Hokey Pokey — all to the great amusement of everyone present. That night, the weather smiled on us, and warming clouds and mist covered our camp. We awoke to thick fog and a cool but not frosty morning. After tea and breakfast, we held our own thank-you ceremony for the hard work of the villagers who had made our stay so enjoyable. As the morning fire burned down, we had a last chance to shop for local goods, including some textiles woven by Sonam, the Village Headman’s daughter. For our hike back we followed the new tractor path installed by the government just last year. A longer route, it took us past a number of high pasture areas above the river and a small stone buckwheat mill. Run by the power of a small stream, the mill was operating unattended when we went by, with raw buckwheat in a woven bamboo funnel being fed into the spinning stone grinder below. We were back in Bumthang by mid-afternoon to get ready for tomorrow’s travel leg heading back west. While today was mainly a travel day, there was no shortage of points of interest. 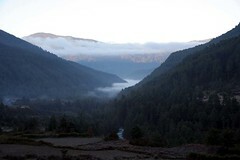 In the morning we retraced our path out of Bumthang Valley on our way back west, taking the route that led through town. On the other route (which we took a number of times over the past three days) we would have gone past the home of what must likely be Bumthang’s longest resident family. 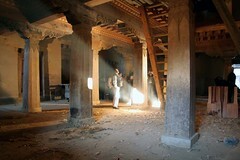 In a modest home near a set of three old chortens live the decendents of the Raja of this area from hundreds of years ago. After seeing the “snake” village and large chorten and mani wall from earlier in the trip, we were out of the Bumthang region and would have our last chance for a glimpse of Cholmohari, the most sacred peak in all of Bhutan. While it was shrouded in clouds during our drive in to the region, chrystal-clear skies prevailed today, giving us an excellent view of the snow-capped Cholmohari. From our vantage point, it did not seem particularly higher than the surrounding peaks, but we still need to consider that it is significantly further than the (relatively) modest peaks of the closer Black Mountains. While any view of Cholmohari is worth stopping for, we couldn’t linger too long — we were scheduled to meet a film crew shooting footage for a Discovery Channel Asia show on “tulkus” or reincarnate lamas. 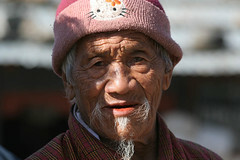 The premise of the tulku was developed in Tibetan-area Buddhism when celibacy became the norm for most monks and lamas. (In some ethnicly Tibetan areas of Nepal, there are still lama positions that pass through decent from father to son, but these are not common nor do these positions seem to carry the same import.) The identification of the reincarnation of a deceased lama is an interesting process that includes seers’ predictions, the interpretation of signs, and other more easily understandable steps. One well known example of a tulku is the Dalai Lama. The current Dalai Lama is the fourteenth incarnation and was recognized at the age of two, using many methods, including a step where monks lay out an array of objects, some of which belonged to the previous incarnation, and the child must recognize these. (This process was partly shown in the film, “Kundun.”) However, it is not uncommon for the tulku to know who he (or, but less commonly, she) is and inform the family that they should contact a certain monestary since he wants to go back and get on with his studies. We made contact with the film crew just before the pass and continued with them down to a monestary where we we able to meet five tulkus, ranging in age from seven to twenty-one. Bob had some discussions with them and we were given the chance for some questions. Interestingly, the two eldest tulkus said that they themselves knew they were reincarnations of particular lamas before they were identified by others. The monestary itself is undergoing renovations, so the main building has all the ornate carvings of other temples but lacks the colorful paint and interior finishings. Prior to the renovations beginning, the temple had to undergo an entire process of de-consecration so that all the images and contents could be moved out. Amazingly, all the reconstruction work is being done using classic methods — from hand-carving the decorations with various chisels to hand-finishing the enormous supporting roof beams with a tool most like a long-handled machete. Tomorrow we have another travel day, but among the agenda is a stop at a preserve for the black-necked crane, which spends winters in Bhutan before heading north to Siberia in the summer. This rare bird should be quite a sight! 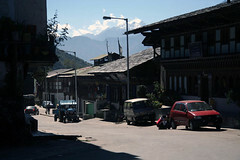 Today, our primary goal was to get into Thimphu, the capital, but that didn’t get in the way of a few interesting stops. 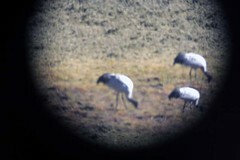 This morning we had a short walk down from the guest house to the black-necked crane sanctuary. In previous years, there had been a blind set up close to the feeding grounds that involved a pre-dawn slog through the marshes to get a close-up glimpse of the cranes as they awoke. (You know I would have been 100% up for that!) Unfortunately, the blind has been done away with, thanks to previous tourists simply refusing to stay inside the blind area. So we were confined to the telescope viewing area, which offered limited chance for good photos — but I still managed to snap a shot through the eyepiece of one of the spotting scopes. 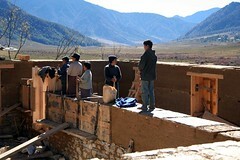 As we drove out of Phubjikha Valley, we noticed a house under construction and the workers were putting up an internal wall using the time-tested “pounded earth” method. A frame is set up and loose earth is shovelled in. Then the earth is beaten down until it is compressed into what is similar to a single enormous adobe brick. This is one of the traditional methods of building in Bhutan and has been used to create some enourmous structures, including the walls for the temple that was undergoing renovations that we saw the day before. With the clear skies and driving course that took us over a number of 10,000+-foot passes today, we had excellent moments to see some of the distant peaks of the higher Himalaya. One peak, Gangkhar Phuntsum, sits just near the border between Bhutan and Tibet (currently China) and is the tallest peak in the world that is still unclmbed. 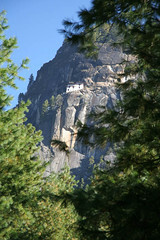 This status is unlikely to change anytime soon, since Bhutanese law prohibits technical climbing above 6,500m (about 21,000 feet): local custom considers many of these peaks sacred and the home of deities and there is simple no emergency response capability in the country to attempt a rescue at these altitudes. We arrived in Thimphu in early evening and while this city has fewer than 100,000 people, it seemes like a real metropolis after our travels. Nestled down in its valley, Thimphu was just a spread of lights that evening and our night in the Druk Hotel made clear why Bhutan is not only known a “Land of the Thunder Dragon” but also “land of the stray dog.” Local wisdom holds that beings who were almost reincarnated as people but just missed a human life are born as dogs and that Buddhist monks who break their vows also have a propensity to be reborn as dogs. So much like cows in India, stray dogs pretty much have the run of the place here and they tend to bark it up at night. We spent the next morning taking in some of the handicraft centers here in the capital. 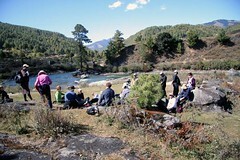 The papermaking center was a popular spot, located in a small building across the Thimphu River. The workers start with fiber not from trees but from shrubs like Daphne, which is soaked for 24 hours, cut into strips, boiled and then soaked again. These strips are then ground up with a binding agent and the pulp is mixed with water and poured into shallow vats. The paper makers then dip their wooden frames into the mixture, collecting a thin layer of pulp on the framed screen. 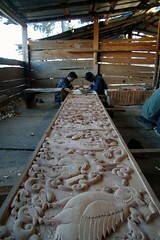 This screen is lifted out and the sheet of paper is layed out to dry. We also had a chance to look in on classes in the government-run school for handicrafts, which includes woodcarving, scultpure, lacquer work, embroidery, and thangkha painting. Thangkhas are Buddhist icons painted or embroidered on canvas, mounted on fabric backing and are displayed in temples and homes as inspirational images. In the thangkha class, we could see younger students working on their drawing skills and older students actually painting under the watchful eye of the instructor. This year, the first girls will graduate from the thangkha school, just one example of the modernization that the current king has been pushing throughout Bhutan. That afternoon we were free to shop and I made what I would call a valiant effort to update the blog. Unfortunately, the combination of high demand and questionable equipment made posting surprisingly difficult here in the capital. While the internet connection speed was far and away the fastest in the country (a whopping 100Mbps) the actual computer at the Druk seemed to have some problems stemming from the combination of lots of users, uncertain security measures and, well, Microsoft Windows. Our last night was marked with a dinner where we had a chance to meet with a number of representatives from government ministries and private businesses. My mom made a point of taking some of her personal time to go to the hospital for western medicine in Thimphu and visit the cytopathology department. As supervisor of cytopathology at New York Presbyterian, she is always interested in seeing how people around the world address the issues we face in the United States and fostering communication and information sharing among professionals. Maybe she’ll come back to Bhutan to work with the hospital on her specialty, quality assurance measures — we’ll just have to wait and see! The next day was the king’s birthday and the celebration began early with groups of school children performing a grand procession to the music of a uniformed band. By 10:00 am, the stadium area was packed cheek to jowl with thousands of people who had come out to celebrate the royal birthday. Finding a spot with even a fair view of the field quickly became a difficult and possibly risky process. Many groups of young people in their school uniforms braved the strong mid-day sun to make the most of this day off from their studies and citizens of all ages and walks of life shared equally in this celebration. Interestingly, the king himself is said to be uncomfortable with the pomp and circumstance of such functions and generally chooses to name a “special guest” to oversee them. Recently, the king celebrated 25 years on the throne and despite a groundswell movement for a major celebration, he decided that the money could be better spent on the nation and chose a subtler celebration. That afternoon we made our way back to Paro and the wonderful Zhiwa Ling Hotel. We stopped for our last monestary visit to an ancient sight that we skipped when we were here first. Built in the 7th century — fully 100 years before Buddhism was offically introduced to Bhutan — this monestary was one of 108 that were built in one year, mostly throughout Tibet, but a handful are in present-day Nepal and Bhutan and we were able to have our last teaching and meditation session in the temple. That evening we had our last dinner together, a touching and poignant time that allowed us to combine a chance to reminisce about the truly wonderful nature of our time together with an early birthday celebration for our intrepid trip leader, Brent. As put so eloquently by Clark, this is the first trip that, as it draws to a close, really seems to be just beginning for many of us. We’ll be leaving tomorrow, but no doubt memories, friendships and a spiritual awareness have been created here that will last far into the future.